SPOKANE, WASH. — Badass Brewing & No-Li Brewhouse collaborate to create one total ½ barrel of It’s Badass…No-Li Cascadian Stout. 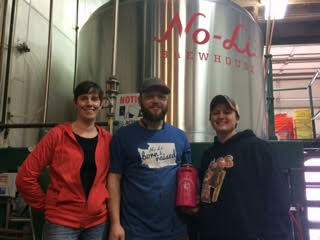 A collaboration inspired by Spokane Craft Week, Charlene Honcik and Kendra Wiiest of Badass Backyard Brewing teamed up with Ryan Brookhart of No-Li Brewhouse. Together, they built a recipe over pints of beer and brewed up It’s Badass...No-Li Cascadian Stout! It’s Badass…No-Li Cascadian Stout combines dark chocolate malt with notes of fresh roasted coffee, and tropical fruity characters from zeus, mosaic and equinox hops; 6.5% alc. & 70 IBU’s. One 1/6 barrel will be featured at the Inland NW Craft Brewers Collaboration event at No-Li Brewhouse on Thursday, May 18th, 4 – 7 p.m.
A second 1/6 barrel will featured at Badass Backyard Brewing during Spokane Craft Beer Week. A third and final 1/6 barrel will be featured at No-Li Brewhouse on Saturday, May 20th. That’s it…only three total 1/6 barrels of It’s Badass…No-Li Cascadian Stout. "Collaborating with other Spokane brewers is a great learning process. This opportunity is badass," says Ryan Brookhart, No-Li Brewhouse Production and Head Brewer. Labels: Badass Brewing, No-Li Brewhouse, No-Li Cascadian Stout, Spokane Gives Month.